Unwind at this hidden gem on the tranquil, south end of Lake Osoyoos. Located on a quiet, private cul-de-sac minutes away from the town of Osoyoos. Walking distance to local winery Young & Wyse and beautiful Haynes Point. 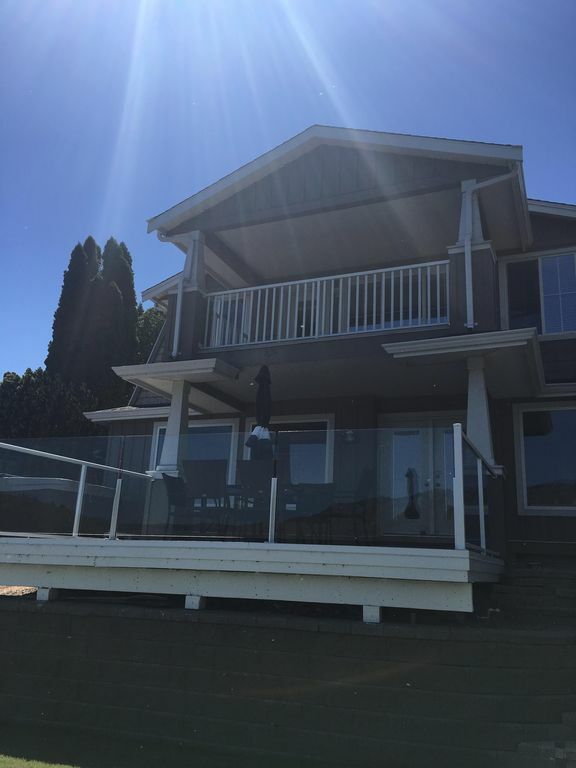 Soak up the sun on the deck, just steps away from the lake. Great wakeboarding, waterskiing, swimming, paddleboarding and kayaking are all at your doorstep. Spend your evenings in a the hot tub and enjoy the sweeping views of vineyards, Anarchist Mountain and amazing star gazing and bird watching. A large open kitchen with stainless steel Decor appliances and gas cook top. Hardwood floors throughout. The second floor consists of extra large master bedroom with a king bed and private patio overlooking the backyard and lake. There is also a second bedroom with a queen bed and a full bathroom. The main floor is the where the kitchen, dinning, living area is as well as another bedroom with a queen bed and full bath. The garage entrance leads into the laundry area with another full bathroom and laundry area. Privacy, tranquility, location and comfort are the key features of this Cape cod waterfront home. There is a trampoline on the property. Outstanding wineries, restaurants and golfing within minutes. Two storey house with many levels, not suitable for those with disabilities. Please let us know if you require any further information. Wonderful property on Osoyoos Lake. Well furnished kitchen, we ended up cooking most of our evening meals. Owners were very responsive on a couple of very minor glitches. Litterally within walking distance to Young & Wise winery. We can't wait to come back during the crush this fall. Beautiful home and amazing location. It was the perfect rental for the ladies get away. We really enjoyed staying at the house. It had everything we needed and allowed for a perfect Scandinavian spa (hot tub to heat/lake cool off). Great weather allowed BBQ/dining in front of the lake, what a view. We had such a good time, this will be on the list for next year's adventure. So happy you had a great trip!! Michelle's home is a beautiful large lake front property very close to many wonderful wineries. The kitchen was well stocked - everything you need to cook some memorable dinners. The beds were wonderfully comfortable and bathrooms adequate (could have used some basic shampoo etc). Outdoor areas enjoy lovely views over the lake and the hottub was a welcome treat. The weekend we visited the lake was flooding a little so we did not swim, but it looks very inviting on a hot day. Highly recommended stay! So happy your group had a great time! I have soap & shampoo under the sink but due to allergies etc, we write in the agreement that we do no supply soaps, shampoo etc. These are there for those who wish to use them. Thank you & we hope to host you & your group again! Spectacular lakefront Paradise and perfect location to visit Wine Country. So happy to hear you and your friends had a great time! Enjoy your bday year of celebrations and we hope you come back to wine country again soon. Amazing waterfront, beautiful lake front! Nice house, very cool and clean, well stocked, well outfitted and close to all the good wineries, discovered the one just up the road. The front patio was wonderful for coffee in the morning and wine in the evening! Thank you for a wonderful and relaxing girls trip. Until confirmed, rates are subject to change without notice. Groups booking must be over 25 years of age CHANGE OVER DAY :FRIDAY SPECIAL RATES FOR LONG STAYS. CHANGE OVER DAYS FLEXIBLE AFTER SEPTEMBER 1st.